As a result of her work, her long commitment to fighting for the right of all children to receive a good education, Phymean has received several prestigious international awards. Through these honors Phymean's work is known to people both in Cambodia and overseas. The awards are significant because of the importance of the organizations making these awards. They add recognition and credibility to Phymean's work in fighting for the right of every child to be educated. 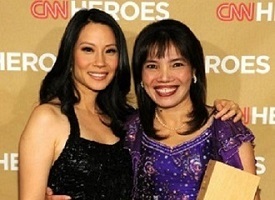 In 2008, Phymean was honored with a CNN Top 10 Heroes Award. Top Ten CNN Heroes Award.. The award was given for her work in rescuing children from a life as child laborers and providing a school for them : Read more…. In 2015, Her Excellency, Hun Bun Rany, the President of the Cambodian Red Cross awarded Phymean the Medal of Honor for her ongoing humanitarian work with the children of Cambodia. Later in 2015 Phymean received an invitation from the Royal Palace to meet with the Queen Mother. She attended the meeting with her family and members of the PIO staff.